Kumul Petroleum Holdings Ltd (KPHL) yesterday thanked the Australian government and Santos Ltd for awarding a scholarship to one of its staff to build PNG resources capacity. KPHL and Santos announced that KPHL geologist Ivano Ivano was the recipient of a scholarship to study a master’s degree in petroleum geoscience at University of Adelaide next year, followed by three-months operational training with Santos. 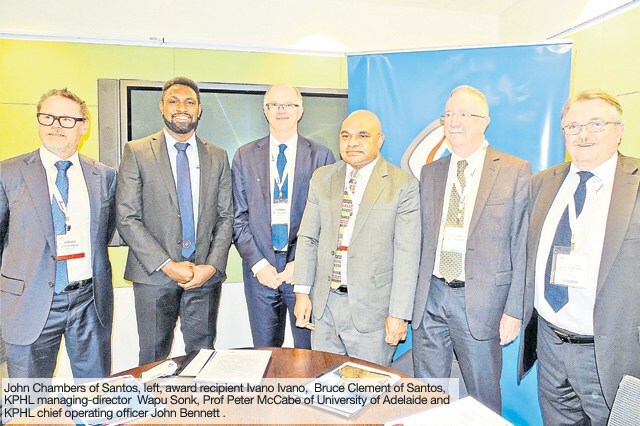 The scholarship is part of a new partnership between Santos and the Australian government to develop technical and management capability in the resources sector in PNG. Ivano is a graduate geologist with KPHL, a partner in the PNG LNG project, and works its Port Moresby office. He said he felt privileged to have been nominated for the scholarship by his company, and to have been selected by the Australian scholarship awards office and Santos. “It’s my ultimate goal to be a leader in the PNG oil and gas industry,” he said. Santos managing director and chief executive Kevin Gallagher said the resources sector was the main driver of PNG’s economic growth. He said it made sense to help build capability within its local workforce. “I am very pleased to be able to support Ivano through a masters in petroleum geoscience and then provide him with hands-on experience at one of our operations,” he said. KPHL managing director Wapu Sonk congratulated Ivano for being the first recipient of the new Santos scholarship programme, which was aimed at growing a highly-skilled workforce in the resources sector in Papua New Guinea. “I am very pleased that the programme is starting after a few months of working on it,” he said. “I thank Santos for partnering with Kumul Petroleum in this very important endeavour. “It is our vision and goal to create opportunities for Papua New Guineans. Ivano grew up in the Eastern Highlands where his father was a field biologist. The cool mountainous environment fuelled his love for the outdoors and that strongly influenced his decision to take up undergraduate studies in geology at the University of PNG. As well as being an avid reader and music enthusiast, Ivano is currently a member of the PNG men’s national basketball team, with whom he hopes to win a gold medal in the upcoming Pacific Games.